Centerfielder receives a second cortisone shot in six days in his lower back. TAMPA, Fla. — Yankees centerfielders past, present and future were the hot topic of the day on Sunday at Steinbrenner Field and two other points in Florida. The day began with two squads of Yankees players heading out for road spring training games. One group went to Clearwater to play the Phillies and another pinstriped posse boarded a bus for Sarasota to take on the Orioles. 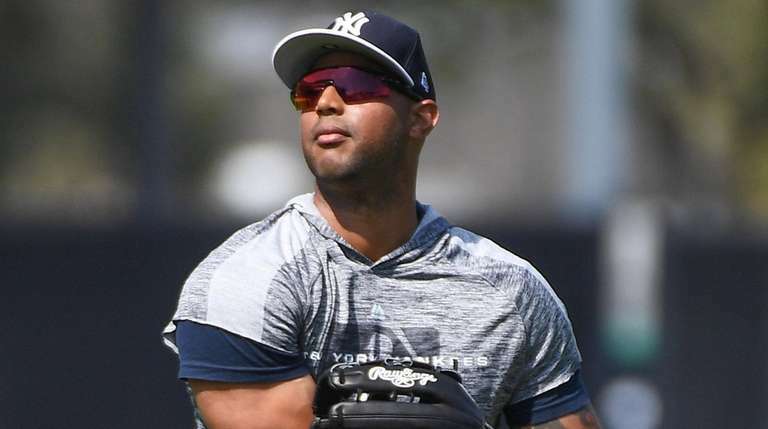 Back at the home office, current centerfielder Aaron Hicks received his second cortisone shot in six days in his ailing lower back. Hicks will start the season on the injured list. Hicks was supposed to be out a day or two when his back started acting up on March 1, but it never got better. The Yankees hope Hicks will return to the lineup for the second series of the season against the Tigers, which begins on April 1. Former starting centerfielder Brett Gardner, who is batting .455 with three home runs and a 1.345 OPS in spring training, will man his old position when the season opens on March 28 at Yankee Stadium against the Orioles. Hicks’ absence could mean the Yankees keep both Greg Bird and Luke Voit on the roster, with one playing first, the other serving as the designated hitter and Giancarlo Stanton replacing Gardner in left. Another former Yankees centerfielder, Jacoby Ellsbury, reported to Steinbrenner Field on Sunday. Ellsbury missed the opening of spring training because of a case of plantar fasciitis. Ellsbury — whose Twitter bio refers to him as “CF for the New York Yankees” — did not play last season because of multiple injuries. He had surgery last August to repair a torn labrum in his left hip. The 35-year-old is owed a guaranteed $47.2 million in salary for this season and next (that total includes a $5-million buyout for 2022). Ellsbury had a physical on Sunday, after which he declined to talk to reporters, saying the Yankees preferred to have him interviewed on Monday. A few lockers over from Ellsbury, top prospect Estevan Florial was chatting on the phone wearing a brace on his right wrist. Florial, 21, whom the Yankees hope will be the centerfielder of the future, suffered a non-displaced fracture when he crashed into the centerfield fence going after a triple on Saturday. Florial, who missed half of last season because of a broken hamate bone in the same wrist, will undergo an MRI on Monday to determine how long this new injury will keep him out. He said he was told he will not need surgery. With all of the main Yankees outfielders either injured or getting the day off, infielder-by-trade Tyler Wade started in center in Clearwater and 29-year-old minor-leaguer Billy Burns started in center in Sarasota.